"heavy metal poisoning" redirects here. For the 1983 Styx song, see Heavy Metal Poisoning. A 25-foot (7.6 m) wall of coal fly ash contaminated with toxic heavy metals, resulting from the release of 5.4 million cubic yards of coal fly ash slurry into the Emory River, Tennessee, and nearby land and water features, in December 2008. Testing showed significantly elevated levels of arsenic, copper, barium, cadmium, chromium, lead, mercury, nickel, and thallium in samples of slurry and river water. Cleanup costs may exceed $1.2 billion. A toxic heavy metal is any relatively dense metal or metalloid that is noted for its potential toxicity, especially in environmental contexts. The term has particular application to cadmium, mercury, lead and arsenic, all of which appear in the World Health Organization's list of 10 chemicals of major public concern. Other examples include manganese, chromium, cobalt, nickel, copper, zinc, selenium, silver, antimony and thallium. Heavy metals are found naturally in the earth. They become concentrated as a result of human caused activities and can enter plant, animal, and human tissues via inhalation, diet, and manual handling. Then, they can bind to and interfere with the functioning of vital cellular components. The toxic effects of arsenic, mercury, and lead were known to the ancients, but methodical studies of the toxicity of some heavy metals appear to date from only 1868. In humans, heavy metal poisoning is generally treated by the administration of chelating agents. Some elements otherwise regarded as toxic heavy metals are essential, in small quantities, for human health. Tetraethyl lead is one of the most significant heavy metal contaminants in recent use. Heavy metals are found naturally in the earth, and become concentrated as a result of human activities. Common sources are mining and industrial wastes; vehicle emissions; lead-acid batteries; fertilisers; paints; treated woods; aging water supply infrastructure; and microplastics floating in the world's oceans. Arsenic, cadmium and lead may be present in children's toys at levels that exceed regulatory standards. Lead can be used in toys as a stabilizer, color enhancer, or anti-corrosive agent. Cadmium is sometimes employed as a stabilizer, or to increase the mass and luster of toy jewelry. Arsenic is thought to be used in connection with coloring dyes. Regular imbibers of illegally distilled alcohol may be exposed to arsenic or lead poisoning the source of which is arsenic-contaminated lead used to solder the distilling apparatus. Rat poison used in grain and mash stores may be another source of the arsenic. 4Pb, it was used extensively in gasoline during the 1930s–1970s. Lead levels in the aquatic environments of industrialised societies have been estimated to be two to three times those of pre-industrial levels. Although the use of leaded gasoline was largely phased out in North America by 1996, soils next to roads built before this time retain high lead concentrations. Lead (from lead(II) azide or lead styphnate used in firearms) gradually accumulates at firearms training grounds, contaminating the local environment and exposing range employees to a risk of lead poisoning. Heavy metals enter plant, animal and human tissues via air inhalation, diet and manual handling. Motor vehicle emissions are a major source of airborne contaminants including arsenic, cadmium, cobalt, nickel, lead, antimony, vanadium, zinc, platinum, palladium and rhodium. Water sources (groundwater, lakes, streams and rivers) can be polluted by heavy metals leaching from industrial and consumer waste; acid rain can exacerbate this process by releasing heavy metals trapped in soils. Plants are exposed to heavy metals through the uptake of water; animals eat these plants; ingestion of plant- and animal-based foods are the largest sources of heavy metals in humans. Absorption through skin contact, for example from contact with soil, or metal containing toys and jewelry, is another potential source of heavy metal contamination. Toxic heavy metals can bioaccumulate in organisms as they are hard to metabolize. Heavy metals "can bind to vital cellular components, such as structural proteins, enzymes, and nucleic acids, and interfere with their functioning". Symptoms and effects can vary according to the metal or metal compound, and the dose involved. Broadly, long-term exposure to toxic heavy metals can have carcinogenic, central and peripheral nervous system and circulatory effects. For humans, typical presentations associated with exposure to any of the "classical" toxic heavy metals, or chromium (another toxic heavy metal) or arsenic (a metalloid), are shown in the table. The toxic effects of arsenic, mercury and lead were known to the ancients but methodical studies of the overall toxicity of heavy metals appear to date from only 1868. In that year, Wanklyn and Chapman speculated on the adverse effects of the heavy metals "arsenic, lead, copper, zinc, iron and manganese" in drinking water. They noted an "absence of investigation" and were reduced to "the necessity of pleading for the collection of data". In 1884, Blake described an apparent connection between toxicity and the atomic weight of an element. The following sections provide historical thumbnails for the "classical" toxic heavy metals (arsenic, mercury and lead) and some more recent examples (chromium and cadmium). 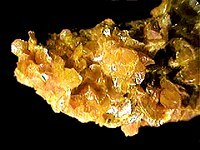 Orpiment, a toxic arsenic mineral used in the tanning industry to remove hair from hides. 3), was known in ancient times. Strabo (64–50 BCE – c. AD 24? ), a Greek geographer and historian, wrote that only slaves were employed in realgar and orpiment mines since they would inevitably die from the toxic effects of the fumes given off from the ores. Arsenic-contaminated beer poisoned over 6,000 people in the Manchester area of England in 1900, and is thought to have killed at least 70 victims. Clare Luce, American ambassador to Italy from 1953 to 1956, suffered from arsenic poisoning. Its source was traced to flaking arsenic-laden paint on the ceiling of her bedroom. She may also have eaten food contaminated by arsenic in flaking ceiling paint in the embassy dining room. Ground water contaminated by arsenic, as of 2014, "is still poisoning millions of people in Asia". Saint Isaac's Cathedral, in Saint Petersburg, Russia. The gold-mercury amalgam used to gild its dome caused numerous casualties among the workers involved. The first emperor of unified China, Qin Shi Huang, it is reported, died of ingesting mercury pills that were intended to give him eternal life. The phrase "mad as a hatter" is likely a reference to mercury poisoning among milliners (so-called "mad hatter disease"), as mercury-based compounds were once used in the manufacture of felt hats in the 18th and 19th century. Historically, gold amalgam (an alloy with mercury) was widely used in gilding, leading to numerous casualties among the workers. It is estimated that during the construction of Saint Isaac's Cathedral alone, 60 workers died from the gilding of the main dome. Outbreaks of methylmercury poisoning occurred in several places in Japan during the 1950s due to industrial discharges of mercury into rivers and coastal waters. The best-known instances were in Minamata and Niigata. In Minamata alone, more than 600 people died due to what became known as Minamata disease. More than 21,000 people filed claims with the Japanese government, of which almost 3000 became certified as having the disease. In 22 documented cases, pregnant women who consumed contaminated fish showed mild or no symptoms but gave birth to infants with severe developmental disabilities. Since the industrial Revolution, mercury levels have tripled in many near-surface seawaters, especially around Iceland and Antarctica. 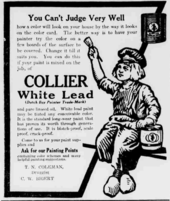 Dutch Boy white lead paint advertisement, 1912. The adverse effects of lead were known to the ancients. In the 2nd century BC the Greek botanist Nicander described the colic and paralysis seen in lead-poisoned people. Dioscorides, a Greek physician who is thought to have lived in the 1st century CE, wrote that lead "makes the mind give way". Lead was used extensively in Roman aqueducts from about 500 BC to 300 AD. Julius Caesar's engineer, Vitruvius, reported, "water is much more wholesome from earthenware pipes than from lead pipes. For it seems to be made injurious by lead, because white lead is produced by it, and this is said to be harmful to the human body." During the Mongol period in China (1271−1368 AD), lead pollution due to silver smelting in the Yunnan region exceeded contamination levels from modern mining activities by nearly four times. [n 1] In the 17th and 18th centuries, people in Devon were afflicted by a condition referred to as Devon colic; this was discovered to be due to the imbibing of lead-contaminated cider. In 2013, the World Health Organization estimated that lead poisoning resulted in 143,000 deaths, and "contribute[d] to 600,000 new cases of children with intellectual disabilities", each year. In the U.S. city of Flint, Michigan, lead contamination in drinking water has been an issue since 2014. The source of the contamination has been attributed to "corrosion in the lead and iron pipes that distribute water to city residents". In 2015, drinking water lead levels in north-eastern Tasmania, Australia, were reported to reach over 50 times national drinking water guidelines. The source of the contamination was attributed to "a combination of dilapidated drinking water infrastructure, including lead jointed pipelines, end-of-life polyvinyl chloride pipes and household plumbing". 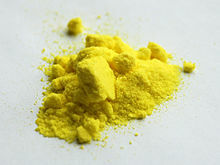 Potassium chromate, a carcinogen, is used in the dyeing of fabrics, and as a tanning agent to produce leather. Chromium(III) compounds and chromium metal are not considered a health hazard, while the toxicity and carcinogenic properties of chromium(VI) have been known since at least the late 19th century. In 1890, Newman described the elevated cancer risk of workers in a chromate dye company. Chromate-induced dermatitis was reported in aircraft workers during World War II. In 1963, an outbreak of dermatitis, ranging from erythema to exudative eczema, occurred amongst 60 automobile factory workers in England. The workers had been wet-sanding chromate-based primer paint that had been applied to car bodies. In Australia, chromium was released from the Newcastle Orica explosives plant on August 8, 2011. Up to 20 workers at the plant were exposed as were 70 nearby homes in Stockton. The town was only notified three days after the release and the accident sparked a major public controversy, with Orica criticised for playing down the extent and possible risks of the leak, and the state Government attacked for their slow response to the incident. 99.999% purity cadmium bar and 1 cm3 cube. Cadmium exposure is a phenomenon of the early 20th century, and onwards. In Japan in 1910, the Mitsui Mining and Smelting Company began discharging cadmium into the Jinzugawa river, as a byproduct of mining operations. Residents in the surrounding area subsequently consumed rice grown in cadmium-contaminated irrigation water. They experienced softening of the bones and kidney failure. The origin of these symptoms was not clear; possibilities raised at the time included "a regional or bacterial disease or lead poisoning". In 1955, cadmium was identified as the likely cause and in 1961 the source was directly linked to mining operations in the area. In February 2010, cadmium was found in Walmart exclusive Miley Cyrus jewelry. Wal-Mart continued to sell the jewelry until May, when covert testing organised by Associated Press confirmed the original results. In June 2010 cadmium was detected in the paint used on promotional drinking glasses for the movie Shrek Forever After, sold by McDonald's Restaurants, triggering a recall of 12 million glasses. 2[PbEDTA], which is passed out of the body in urine. In humans, heavy metal poisoning is generally treated by the administration of chelating agents. These are chemical compounds, such as CaNa2 EDTA (calcium disodium ethylenediaminetetraacetate) that convert heavy metals to chemically inert forms that can be excreted without further interaction with the body. Chelates are not without side effects and can also remove beneficial metals from the body. Vitamin and mineral supplements are sometimes co-administered for this reason. Soils contaminated by heavy metals can be remediated by one or more of the following technologies: isolation; immobilization; toxicity reduction; physical separation; or extraction. Isolation involves the use of caps, membranes or below-ground barriers in an attempt to quarantine the contaminated soil. Immobilization aims to alter the properties of the soil so as to hinder the mobility of the heavy contaminants. Toxicity reduction attempts to oxidise or reduce the toxic heavy metal ions, via chemical or biological means into less toxic or mobile forms. Physical separation involves the removal of the contaminated soil and the separation of the metal contaminants by mechanical means. Extraction is an on or off-site process that uses chemicals, high-temperature volatization, or electrolysis to extract contaminants from soils. The process or processes used will vary according to contaminant and the characteristics of the site. Some elements otherwise regarded as toxic heavy metals are essential, in small quantities, for human health. These elements include vanadium, manganese, iron, cobalt, copper, zinc, selenium, strontium and molybdenum. A deficiency of these essential metals may increase susceptibility to heavy metal poisoning. ^ Up to one-sixth of China's arable land might be affected by heavy metal contamination. ^ Guney, Mert; Zagury, Gerald J. (4 January 2014). "Bioaccessibility of As, Cd, Cu, Ni, Pb, and Sb in Toys and Low-Cost Jewelry". Environmental Science & Technology. 48 (2): 1238–1246. Bibcode:2014EnST...48.1238G. doi:10.1021/es4036122. PMID 24345102. Balasubramanian, R; He, J; Wang, LK (2009). "Control, Management, and Treatment of Metal Emissions from Motor Vehicles". In Shammas, LK; Wang, JP; Chen, Y; et al. (eds.). Heavy Metals in the Environment. CRC Press. pp. 475–490. ISBN 978-1420073164. Baldwin DR, Marshall WJ (1999). "Heavy metal poisoning and its laboratory investigation". Ann Clin Biochem. 36 (3): 267–300. CiteSeerX 10.1.1.528.7546. doi:10.1177/000456329903600301. PMID 10376071. Bánfalvi, G (2011). "Heavy Metals, Trace Elements and their Cellular Effects". In Bánfalvi, G (ed.). Cellular Effects of Heavy Metals. Springer. pp. 3–28. ISBN 9789400704275. Barceloux DG (1999). "Chromium". J Toxicol Clin Toxicol. 37 (2): 173–94. doi:10.1081/CLT-100102418. PMID 10382554. Blake J (1884). "On the Connection Between Physiological Action and Chemical Constitution". The Journal of Physiology. 5 (1): 36–44. doi:10.1113/jphysiol.1884.sp000148. PMC 1484879. PMID 16991361. Brathwaite RL, Rabone SD (1985). "Heavy Metal Sulphide Deposits and Geochemical Surveys for Heavy Metals in New Zealand". Journal of the Royal Society of New Zealand. 15 (4): 363–370. doi:10.1080/03036758.1985.10421713. Cameron CA (1871). "Half-yearly Report on Public Health". Dublin Quarterly Journal of Medical Science. 52 (2): 475–498. doi:10.1007/BF02944536. "Chelation Therapy". American Cancer Society. 2008. Retrieved 2014-04-28. "Chelation: Therapy or "Therapy"?". National Capital Poison Center. 2010. Chowdhury BA, Chandra RK (1987). "Biological and health implications of toxic heavy metal and essential trace element interactions". Prog Food Nutr Sci. 11 (1): 55–113. PMID 3303135. Cole M.; Lindeque P.; Halsband C.; Galloway T.S. (2011). "Microplastics as contaminants in the marine environment: A review". Marine Pollution Bulletin. 62 (12): 2588–2597. doi:10.1016/j.marpolbul.2011.09.025. hdl:10871/19649. PMID 22001295. Csuros M (1997). Environmental Sampling and Analysis Lab Manual. Lewis. ISBN 978-1566701785. Davidson PW, Myers GJ, Weiss B (2004). "Mercury exposure and child development outcomes". Pediatrics. 113 (4 Suppl): 1023–9. doi:10.1542/peds.113.4.S1.1023 (inactive 2019-02-17). PMID 15060195. Dewan S (26 December 2008). "Tennessee Ash Flood Larger Than Initial Estimate". New York Times. Dewan S (1 January 2009). "Metal Levels Found High in Tributary After Spill". New York Times. Di Maio, VJM (2001). Forensic Pathology (2nd ed.). CRC Press. ISBN 978-0849300721. Dueck, D (2000). Strabo of Amasia: A Greek Man of Letters in Augustan Rome. Routledge. ISBN 978-0415216722. Duffus JH (2002). "Heavy Metals"—A Meaningless Term?". Pure and Applied Chemistry. 74 (5): 793–807. doi:10.1351/pac200274050793. Dyer P (2009). "The 1900 Arsenic Poisoning Epidemic". Brewery History (130): 65–85. Emsley, J (2011). Nature's Building Blocks. Oxford University Press. ISBN 9780199605637. Evanko, CA; Dzombak, DA (1997). "Remediation of Metals-Contaminated Soils and Groundwater". Technology Evaluation Report. CiteSeerX 10.1.1.401.3768. TE 97-0-1. Finch, LE; Hillyer, MM; Leopold, MC (2015). "Quantitative Analysis of Heavy Metals in Children's Toys and Jewelry: A Multi-Instrument Multitechnique Exercise in Analytical Chemistry and Public Health". Journal of Chemical Education. 92 (5): pp.&nbsp, 849–854. Bibcode:2015JChEd..92..849F. doi:10.1021/ed500647w. Gilbert SG, Weiss B (2006). "A Rationale for Lowering the Blood Lead Action Level from 10 to 2 μg/dL". Neurotoxicology. 27 (5): 693–701. doi:10.1016/j.neuro.2006.06.008. PMC 2212280. PMID 16889836. Haines, AT; Nieboer, E (1988). "Chromium hypersensitivity". In Nriagu, JO; Nieboer, E (eds.). Chromium in the Natural and Human Environments. Wiley. pp. 497–532. ISBN 978-0471856436. Harvey PJ, Handley HK, Taylor MP (April 2015). "Identification of the sources of metal (lead) contamination in drinking waters in north-eastern Tasmania using lead isotopic compositions". Environmental Science and Pollution Research. 22 (16): 12276–12288. doi:10.1007/s11356-015-4349-2. PMID 25895456. Hawkes SJ (1997). "What is a "Heavy Metal"?". Journal of Chemical Education. 74 (11): 1374. Bibcode:1997JChEd..74.1374H. doi:10.1021/ed074p1374. Hillman AL, Abbot MB, Yu JQ, Bain DJ, Chiou-Peng TH (2015). "Environmental Legacy of Copper Metallurgy and Mongol Silver Smelting Recorded in Yunnan Lake Sediments". Environmental Science & Technology. 49 (6): 3349–3357. Bibcode:2015EnST...49.3349H. doi:10.1021/es504934r. PMID 25685905. "Heavy Metal Poisoning". National Organization for Rare Disorders. 2015. Retrieved 11 February 2016. Houlton S (2014). "Boom!". Chemistry World. 11 (12): 48–51. Howell N, Lavers J, Paterson D, Garrett R, Banati R (2012). "Trace metal distribution in feathers from migratory, pelagic birds". Australian Nuclear Science and Technology Organisation. Retrieved 2014-05-03. Jones J (11 August 2011). "Stockton Residents Fume Over Fallout From Orica". Newcastle Herald. Retrieved 2014-05-16. Landis, WG; Sofield, RM; Yu, M-H (2000). Introduction to Environmental Toxicology: Molecular Substructures to Ecological Landscapes. 4th: CRC Press. ISBN 9781439804100. Lovei, M (1998). Phasing Out Lead from Gasoline: Worldwide Experience and Policy Implications. World Bank Technical Paper. 397. The World Bank. ISBN 978-0821341575. ISSN 0253-7494. Mulvihill G, Pritchard J (4 June 2010). "McDonald's Recall: 'Shrek' Glasses Contain Toxic Metal Cadmium". Huffington Post. National Research Council (U.S.). Committee on Biologic Effects of Atmospheric Pollutants (1974). Chromium. National Academies. ISBN 9780309022170. NAP:13852. Needleman H (2004). "Lead poisoning". Annu Rev Med. 55: 209–22. doi:10.1146/annurev.med.55.091902.103653. PMID 14746518. Newman D (1890). "A Case of Adeno-carcinoma of the Left Inferior Turbinated Body, and Perforation of the Nasal Septum, in the Person of a Worker in Chrome Pigments". Glasgow Medical Journal. 33: 469–470. Nielen, MWF; Marvin, HJP (2008). "Challenges in Chemical Food Contaminants and Residue Analysis". In Picó, Y (ed.). Food Contaminants and Residue Analysis. Elsevier. pp. 1–28. ISBN 978-0080931920. Notman N (2014). "Digging Deep for Safer Water". Chemistry World. 11 (4): 54–57. O'Brien N, Aston H (13 November 2011). "The untold story of Orica's chemical leaks". Sydney Morning Herald. Pearce JM (2007). "Burton's Line in Lead Poisoning". Eur Neurol. 57 (2): 118–9. doi:10.1159/000098100. PMID 17179719. Perry, J; Vanderklein, EL (1996). Water Quality: Management of a Natural Resource. Blackwell Science. ISBN 978-0865424692. Pezzarossa, B; Gorini, F; Petruzelli, G (2011). "Heavy Metal and Selenium Distribution and Bioavailability in Contaminated Sites: A Tool for Phytoremediation". In Selim, HM (ed.). Dynamics and Bioavailabiliy of Heavy Metals in the Rootzone. CRC Press. pp. 93–128. ISBN 9781439826225. Poovey B (15 September 2001). "Trial Starts on Damage Lawsuits in TVA Ash Spill". Bloomberg Businessweek. Prioreschi, P (1998). Roman Medicine. A History of Medicine. III. Horatius Press. ISBN 978-1888456035. Pritchard J (19 May 2010). "Wal-Mart Pulls Miley Cyrus Jewelry After Cadmium Tests". USA Today. Qu, C; Ma, Z; Yang, J; Lie, Y; Bi, J; Huang, L (2014). "Human Exposure Pathways of Heavy Metal in a Lead-Zinc Mining Area". In Asrari, E (ed.). Heavy Metal Contamination of Water and Soil: Analysis, assessment, and remediation strategies. Apple Academic Press. pp. 129–156. ISBN 9781771880046. Radojevic, M; Bashkin, VN (1999). Practical Environmental Analysis. Royal Society of Chemistry. ISBN 978-0854045945. Rand, GM; Wells, PG; McCarty, LS (1995). "Introduction to aquatic toxicology". In Rand, GM (ed.). Fundamentals Of Aquatic Toxicology: Effects, Environmental Fate And Risk Assessment (2nd ed.). Taylor & Francis. pp. 3–70. ISBN 978-1560320906. Rogers, MJ (2000). "Text and Illustrations. Dioscorides and the Illuminated Herbal in the Arab Tradition". In Contadini, A (ed.). Arab Painting: Text and Image in Illustrated Arabic Manuscripts. Leiden: Koninklijke Brill NV. pp. 41–48 (41). ISBN 9789004186309. "Rogue mercury". New Scientist. 223 (2981). 2014. Sengupta, AK (2002). "Principles of Heavy Metals Separation". In Sengupta, AK (ed.). Environmental Separation of Heavy Metals: Engineering Processes. Lewis. ISBN 978-1566768849. Srivastava, S; Goyal, P (2010). Novel Biomaterials: Decontamination of Toxic Metals from Wastewater. Springer-Verlag. ISBN 978-3-642-11329-1. "Stop Lead Poisoning in Children". World Health Organization. 2013. "Ten Chemicals of Major Public Health Concern". World Health Organization. 2015. Torrice, M. "How Lead Ended Up In Flint's Tap Water". Chemical & Engineering News. 94 (7): 26–29. Tovey J (17 December 2011). "Patches of Carcinogen Seen After Orica Leak". The Sydney Morning Herald. The United States Pharmacopeia (21st ed.). The United States Pharmacopeial Convention. 1985. ISBN 978-0-913595-04-6. Vallero, DA; Letcher, TM (2013). Unravelling environmental disasters. Elsevier. ISBN 9780123970268. Waldron HA (1983). "Did the Mad Hatter have Mercury Poisoning?". Br Med J (Clin Res Ed). 287 (6409): 1961. doi:10.1136/bmj.287.6409.1961. PMC 1550196. 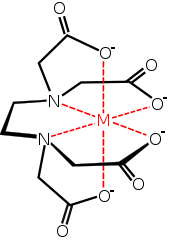 PMID 6418283. Wanklyn, JA; Chapman, ET (1868). Water-analysis: A Practical Treatise on the Examination of Potable Water. Trüber & Company. Whorton, JG (2011). The Arsenic Century. Oxford University Press. ISBN 9780199605996. Worsztynowicz, A; Mill, W (1995). "Potential Ecological Risk due to Acidification of Heavy Industrialized Areas — The Upper Silesia Case". In Erisman, JW; Hey, GJ (eds.). Acid Rain Research: Do We Have Enough Answers?. Elsevier. pp. 353–66. ISBN 978-0444820389. Wright, DA; Welbourn, P (2002). Environmental Toxicology. Cambridge University Press. ISBN 978-0521581516. Zhao HL, Zhu X, Sui Y (2006). "The short-lived Chinese emperors". J Am Geriatr Soc. 54 (8): 1295–6. doi:10.1111/j.1532-5415.2006.00821.x. PMID 16914004.